Scan of the VCD's cover. 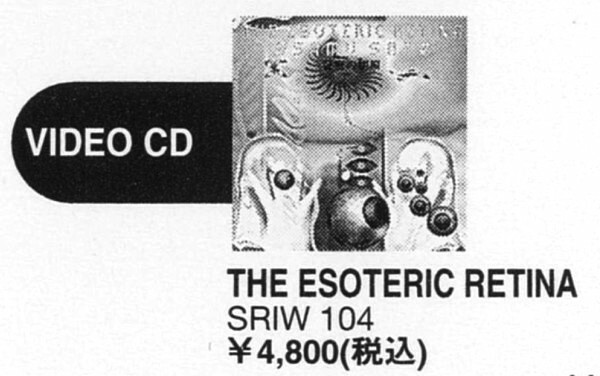 The Esoteric Retina is a Video CD release by Japanese artist Osamu Sato, known for creating surrealistic games such as LSD: Dream Emulator. Published by Sony Music Entertainment, it was supposedly released in 1994 according to the website of Illuminat Co., Ltd. The VCD's rarity was proven to be high and, for years, the disc's contents had not surfaced online. Aside from the fact that it contained several music videos by Osamu, little to no info about its contents was known, with the only evidence of its existence is a mention on the official Outside Directors Company website, a small, low-quality scan of the cover that looks to have been found in a catalog, and its price at the time (which would be around $45 in 2016, not adjusting for inflation). In February 2018, a copy of The Esoteric Retina was auctioned on eBay, being sold with a winning bid of $717.00. The disc's contents were ripped and made available online in late June 2018. ↑ Illuminat Co., Ltd. Retrieved 28 Jun '18. ↑ The Esoteric Retina on eBay. Retrieved 28 Jun '18.